referendum in January 2014 in Basel. My encounter to the idea of a basic income was around 1991-2. I was involved in solidarity activism with a casual worker’s trade union, in which many of the members were homeless construction workers. Some left leaning intellectuals also came to show their solidarity from time to time, and one of them told me that what we need is the idea of ‘unconditional social income’ that was articulated in the Italian autonomist movement. I wasn’t impressed by the idea at that time, mainly because the movement with which we were in solidarity demanded an end to unfairly unpaid or underpaid wages. For me asking ‘income’ in that context sounded like that we are getting amnesty when we want to be proved not guilty. It took several years for me to digest why we need an unconditional basic income. Then it become a secret joy to read Bertrand Russell’s Roads to Freedom, or Philippe van Parijs’s Real Freedom for All, borrowed from a university library. Because the majority of my friends either from activism or academia didn’t like the idea, it remained a personal relief by dreaming a totally different world. In 2004 I attended the BIEN congress in Barcelona where the network changed from ‘European’ to ‘Earth’. I was fascinated by the unique atmosphere, where established, well-known academics talked with anyone in equal and friendly terms, and where many young activists brought enthusiasm. I immediately became a life member. Then I attended almost every congress except 2006. The one in 2014 Montreal was special occasion for me, because I presented my 13 years of oral historical research on the working class feminists who demanded UBI in the 1970s Britain, which was started when Bill introduced me some of those people in 2002. Local and international feminists in the congress encouraged me with positive comments, and I felt relieved that finally I succeeded to convey their forgotten struggle to similar minded contemporary feminists. I was the only participant from Asia in the 2004 congress. The number has grown and this year the congress was held in Korea, and we have five national or regional affiliates in Asia. People in BIEN keep encouraging me to engage both activism and research on UBI, which means a lot for me. In 2012 I was elected to the Executive Committee. At that time it was out of blue, but since then I have tried to expand this unique broad-church organization, especially by writing news for the Basic Income News, and by exploring communications between Asian members. 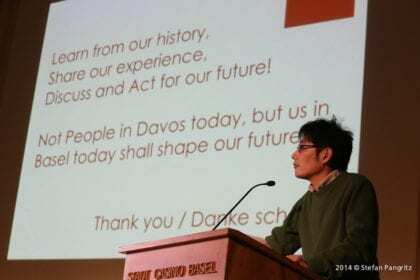 Toru Yamamori is a professor of economics of a Doshisha University in Kyoto, Japan. At the end of 2016, the year in which BIEN celebrated the 30th anniversary of its birth, all Life Members were invited to reflect on their own personal journeys with the organization. See other contributions to the feature edition here.